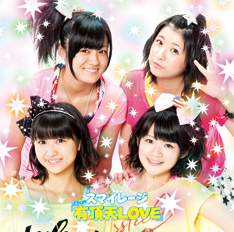 The cover and tracklist for the Event V of S/mileage’s 6th single titled Uchouten LOVE have been released. The cover is really similar to the one used in the Limited B Edition of the single since it features the purikura theme that 2 of the covers have, and the members are positionned the exact same way with Kanon and Saki standing behing Yuuka and Dawa, but the very nice and peaceful expressions of all of the members and the simple stars used instead of the heavy gems really make this cover pop out and for me, it looks the best out of the purikura styled covers. The tracklist on the other hand is in some ways similar to usual Event Vs thanks to the content which is the close-up versions, but since everything about this single is special, I’m really impressed to see that they added the most special scene which is the Deco Mic Vers. where we get to see the girls goof around and do many mimics while singing to the song, and I’m sure this will help many fans be convinced by purchasing a copy to have this special version, along with the super close-ups S/mileage have been so famous for. Overall, even though I usually don’t pay much attention to Event V releases, I’m really happy to see the additions in this one since it has a wonderful cover with a very special tracklist that will please all S/mileage fans who liked this amazing PV and song. The Event V will be sold on 8/20 and 8/27. I’m looking forward to this somewhat. Deco Mic version seems interesting and does S/mileage usually do super close up versions? I’ve never noticed that until now..
Is there like any way to get this without going to the event? Want it sooo bad. I just got my shipment of every version of this single today, so I would absolutely love this to complete my collection.